Van Rijswijk was a Dutch coachbuilder located in The Hague. After manufacturing various leather goods for horses and carriages, the company started to build car bodies in the year 1903. Between the wars they mainly focussed on coachwork manufacturing on the chassis of luxury brands like Bugatti, Isotta-Fraschini, Excelsior, Rolls-Royce and more. Prince Hendrik of Holland owned a Van Rijswijk bodied Minerva and Queen Wilhelmina had her own Spyker built by Van Rijswijk. In the late '30s Van Rijswijk mainly worked with American chassis like Ford, Buick, Packard, Nash and Chevrolet. After World War II the bodyshop made a living by doing the necessary repairs of car bodies. 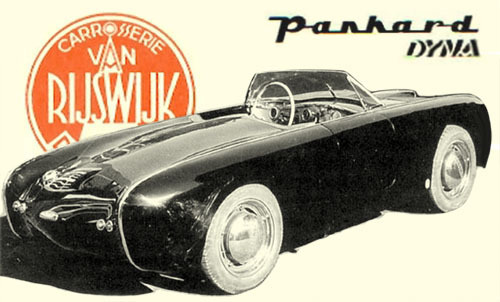 In 1950 Van Rijswijk bodied their last car: this Panhard Dyna. The sleek 'Junior Sportster' body was built on Panhard's type X86 chassis. Van Rijswijk had the intention to build this car in a limited series, but they did not manage to make it cost-effective and so this car remained a one-off. Very little is known about this car... What happened to it? Who owned her? Could she be still alive? Are there any more pictures available? If you have any more images and information to share, please join our forum and contribute anything you may have in the dedicated topic.